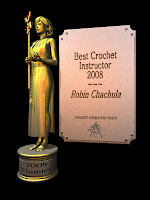 Did anyone get a chance to listen in to the Live 2009 Crochet Awards show on Getting Loopy last night? If so, then you know how absolutely tickled I was to win Best Tech Crochet Book and Best Crochet Instructor. (if not, click the link above and you can listen to the show) Tickled may not be the word, Astounded may be better. Not only for winning the awards, but for being nominated for 6 of them. (Besides the ones I won, I was nominated for Best Crochet Pattern Book, Best Crochet Blog, and Best Crochet Designer of Women's and Men's fashions). Being nominated for so many really touches my heart, especially since I really respect everyone I was nominated with in the categories. It must really mean that a number of you like my work, which is just so wonderful to hear. Every designer has days when they just don't think their work is up to snuff, and I am so lucky that I will be able to look back and say hey- people do like what you are doing- so keep doing it! I have to say winning the Best Crochet Instructor is really amazing. I love to teach, and having my students vote for me was just incredible. Winning the Best Technical Book makes me beam. Knowing that so many of you love crochet symbols as much as I do. So thank you guys so much for taking the time to fill out the survey and vote! And thanks for asking if Blueprint Crochet Two is in the works- that is just so sweet of you. On that last note, all I will say is that stay tuned to the blog and later this week all will be explained. It's been a secret for months now and I am looking forward to spilling soon! That's just because you're The Best, Robyn!